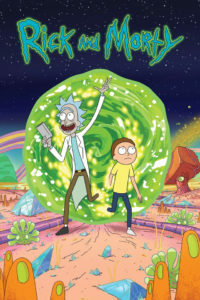 Rick and Morty is a sci-fi comedy cartoon that revolves around the adventures of Rick Sanchez (Roiland) and his grandson Morty (Roiland), increasingly also joined by his granddaughter Summer (Grammer). Rick is a kind of genius mad scientist who works out of the garage of his daughter Beth Smith (Chalke) and her husband Jerry (Parnell). He is kind of an alcoholic, and regularly drools and belches. He has invented the means to travel to other dimensions in which parallel versions of all the characters exist. The characters encounter many aliens. Most of the episodes are spoofs of popular films and TV shows. Rick is an existentialist, convinced of his own superiority. He travels around different universes for lulz, seemingly indifferent to consequences — other than ensuring his own safety — and enjoying whatever pleasures he can along the way. His most abiding characteristic is a deep cynicism towards everyone and everything around him. He fits perfectly the observation about “the secret seductive lure of cynicism: living in truth and goodness is boring; the only authentic challenge is that of Evil, that is, the only space for extraordinary achievements is to be found in transgressive idiosyncrasies.” (Slavoj Žižek, Revolution at the Gates). And yet the entire series is kind of about how Rick is really more than a cynic, that he has empathy and bigger plans. But he recognizes how most people are basically just stupid or evil or both, even as they pretend or try to be otherwise. In spite of Rick’s high intelligence, his grandson Morty — constantly ridiculed by Rick (that is, all of the Ricks of all the dimensions) as being stupid — has a higher sense of morality. Most episodes revolve around the interplay between Rick’s intelligence run amok and Morty’s bumbling yet morally constant skepticism. Morty regularly calls out Rick’s moral ambivalence and the pair almost rights all the wrongs they commit — as the seasons progress, there is much wreckage accumulated from their past adventures. What sets the show apart from many others, cartoon or live action, is the psychological depth of the characters. In spite of the zany sci-fi plots, usually absurdist takes on familiar pop culture films, TV shows, etc., Rick’s moral shortcomings are generally called out and he grudgingly redresses them. In one episode from season two, “The Ricks Must be Crazy,” the show offers a (sideways) critique of capitalism and accumulation of power, told through a story about Rick creating a miniature universe (“microverse”) inside his vehicle’s battery, with the universe’s inhabitants decived into creating electricity for him. The season three episode “The Rickshank Rickdemption” (based on The Shawshank Redemption), has Rick (supposedly) inventing all his gadgets to find a way to recreate a limited-time fast-food dipping sauce created to promote a movie. So, this presents him not as a simple hedonist, but someone who enjoys simple pleasures that come along tangentially in his adventures seeking the mythic sauce. It is about avoiding being imprisoned by illusions, as Beth and Jerry seem to be. This is one of the best and smartest shows on TV, due to the great characters, the intriguing parody/satire plots, and (especially) the biting critique of cynicism.